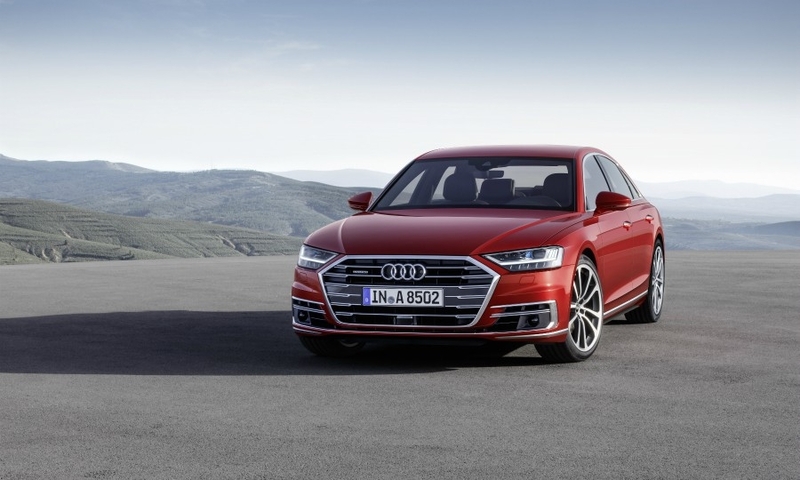 BARCELONA -- Audi's new A8 is the company's the first production car capable of Level 3 autonomous driving, the company said at its launch on Tuesday. Audi becomes the first car company to claim to have productionized Level 3 capability, which allows hands-off capability but requires the driver to take back control at any time. The car can drive itself at speeds up to 60 kph (37 mph) in a setting Audi calls Traffic Jam Pilot. 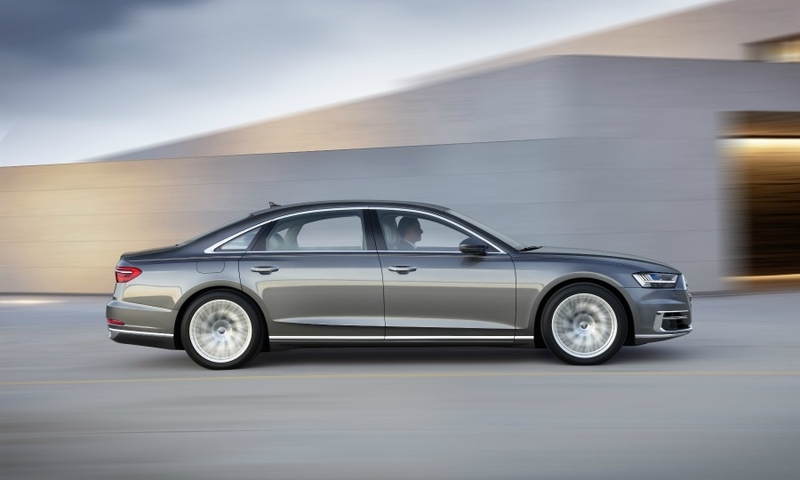 "This will completely change our mobility," Audi sales boss Dietmar Voggenreiter said at A8's unveiling. Right now, Level 3 autonomous driving is not allowed in Germany, but Audi CEO Rupert Stadler expects that to change next year. The Traffic Jam Pilot will only be allowed on highways where oncoming traffic is separated. The car's sensors and the satellite navigation will confirm that conditions are right, after which the driver will activate the function. A series of audio and visual alerts will tell the driver when to retake control, said Mirko Reuter, Audi's head of automated driving said. If the driver doesn't respond to the alerts the vehicle "will become increasingly annoying," he said. 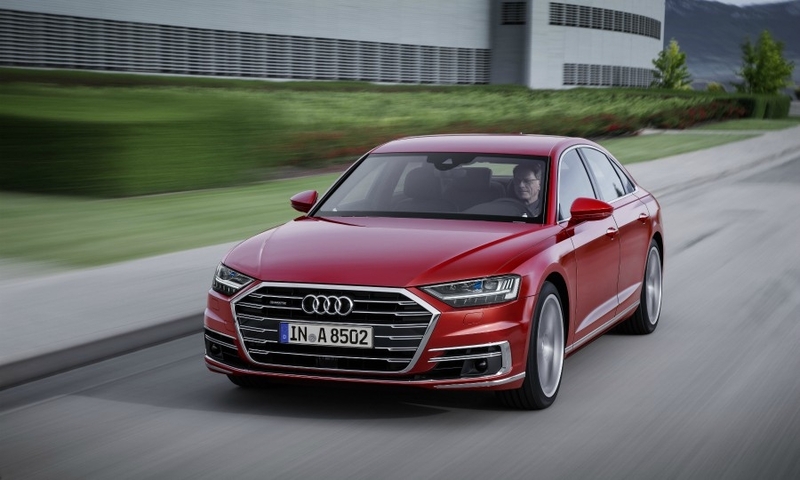 Audi's flagship sedan, which goes on sale in Europe this autumn while U.S. and Chinese sales will start in spring 2018, will include all the hardware needed to achieve Level 3 automation, if a customer purchases the option. They system, however will remain at Level 2 until homologation standards and a legislative framework has been approved in various markets. The timeframe for these approvals is uncertain. “We are in unchartered territory here,” Peter Mertens, Audi’s head of r&d, told Automotive News Europe Tuesday. Said Audi's Reuter: “If you want Level 3 it’s probably best to buy later on." 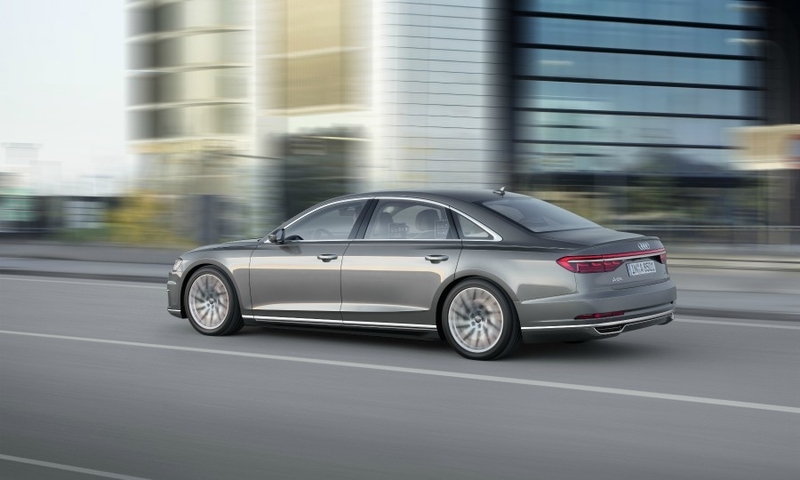 The A8 will start at 90,600 euros in Germany while long-wheelbase versions of the sedan will cost 3,500 euros more. 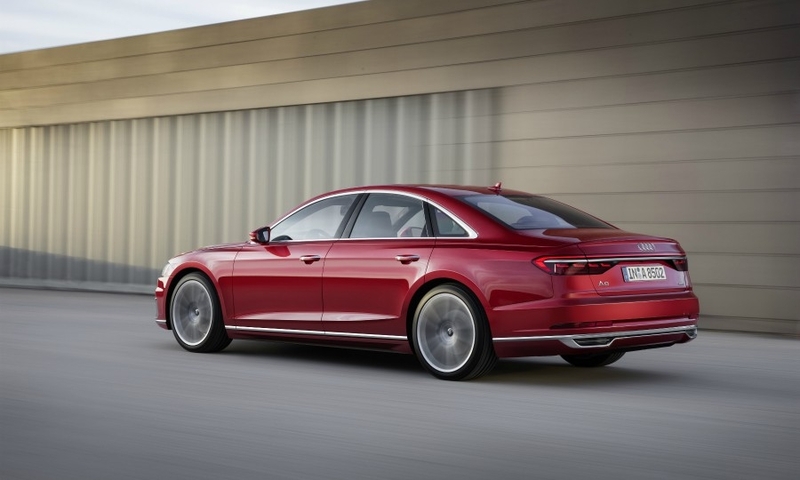 Audi only will offer the long-wheelbase A8 in U.S and China. 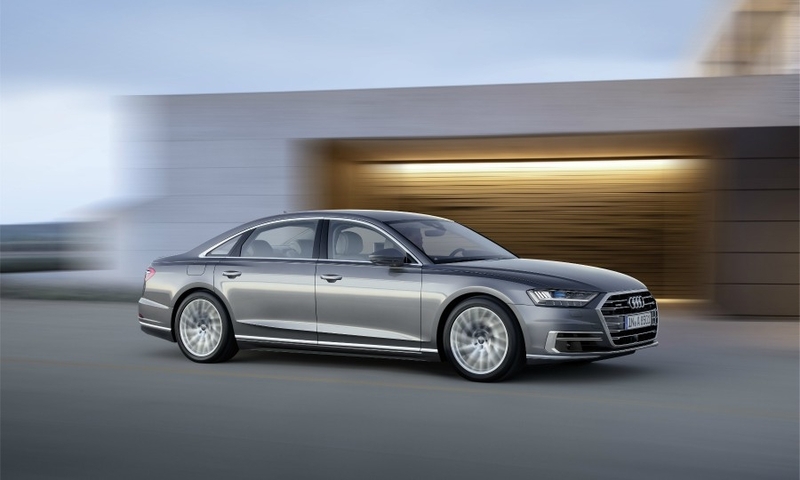 Audi wouldn’t reveal its planned pricing for the A8's optional autonomous functions. 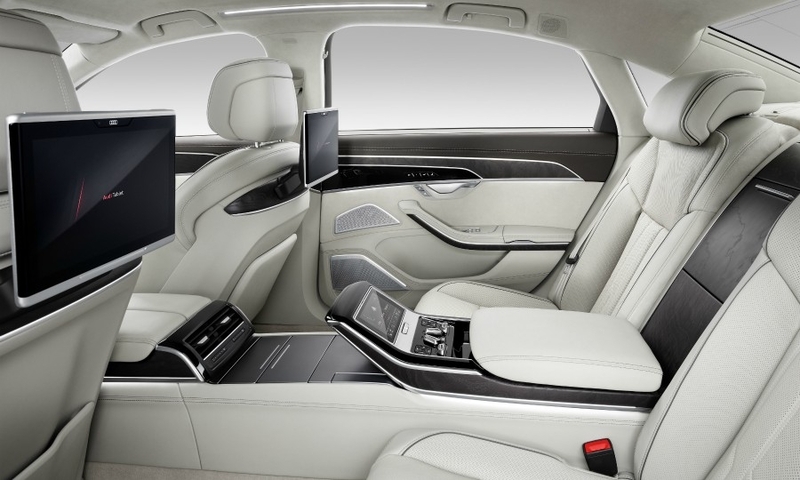 The A8 also is the first car equipped with a laser scanner (lidar) to help feed information on its surroundings to the central driving assistance controller, called zFAS. Cars fitted with the autonomous driving solution will also be able park themselves in garages without the need for the driver to be sitting in the car. That function will also need to be activated by the dealer after the system has been given approval. Other technology on the car includes an active suspension system powered by a 48-volt electrical network. An electric motor on each wheel adapts the suspension on that corner of the car based on the road conditions, which are monitored for bumps by a camera scanning the road ahead. 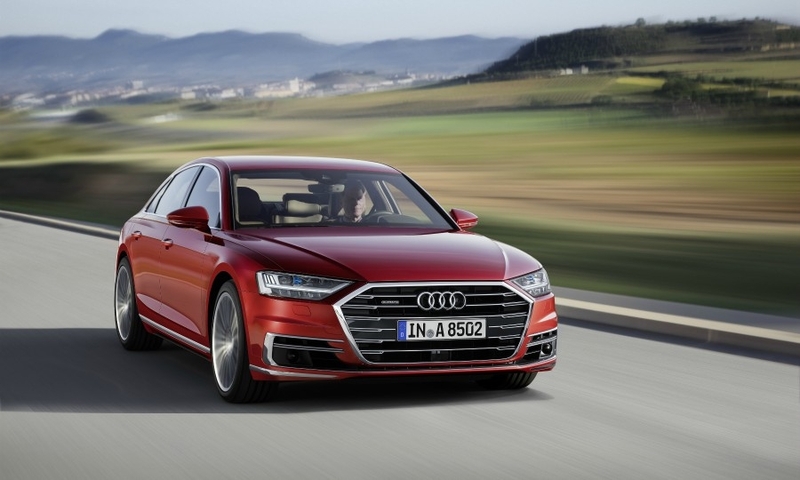 The 48-volt network also powers a mild-hybrid system that is fitted to all five of the A8's engine options, meaning all versions are partially electrically driven. The belt-driven alternator-starter motor helps reduce fuel consumption by delivering enough energy to power the car briefly from rest before the combustion engine takes over. 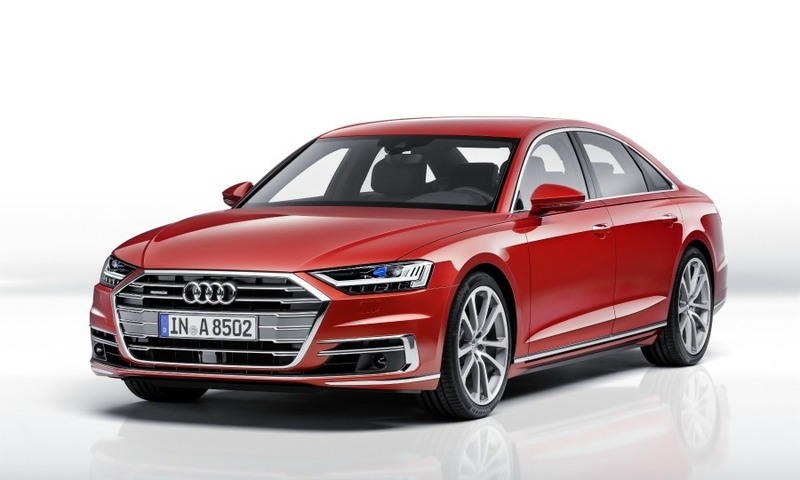 A plug-in hybrid version of the A8 mated to a 3.0-liter V-6 gasoline engine will provide 50 km (31 miles) of pure electric driving, Audi said. The car will arrive at a later date, Audi said without being specific. The launch engines will be a 3.0-liter diesel and a 3.0-liter gasoline, both V-6, with an eight-cylinder diesel and a 12-cylinder gasoline following later. The A8 will come with the option of four-wheel steering that reduces the turning circle below that of the smaller A4, Audi said. 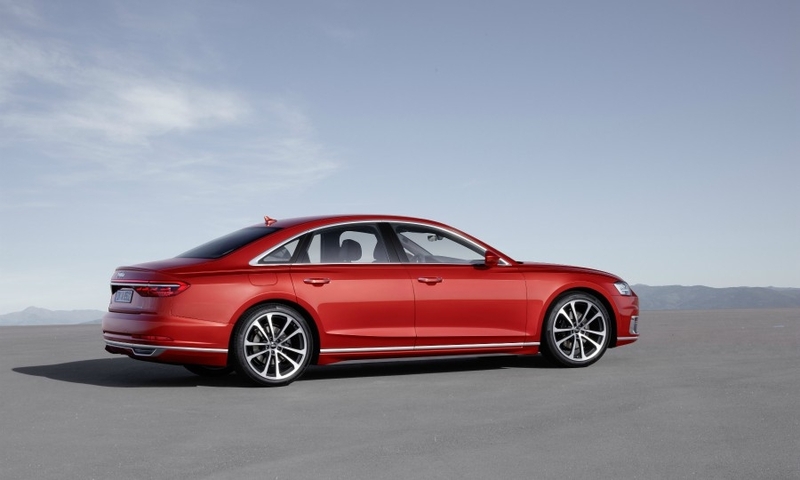 The system also ensures a "high level of handling stability" Audi said. 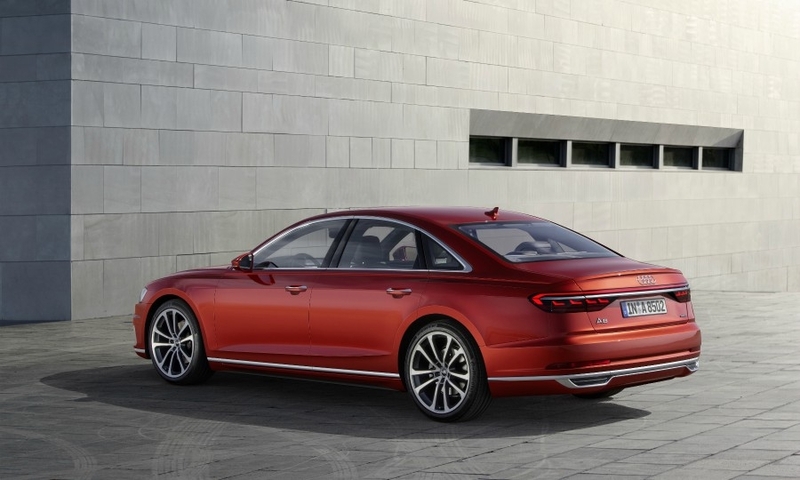 The profile of the new car is more like a four-door coupe than a sedan, Audi head of design Marc Lichte said at the unveiling. The slope of the rear screen gives a more cab-forward design that looks like the rear is pushing the car forward "like a classic motor yacht," he said. Despite the sloping roof toward the back the car has 20mm more headroom in the rear, he said. The dashboard has been simplified to reduce the number of buttons. The rotary dial from the current car has now gone and replacement with a large 10.1-inch touchscreen that Audi says blends almost invisibly into the dash. 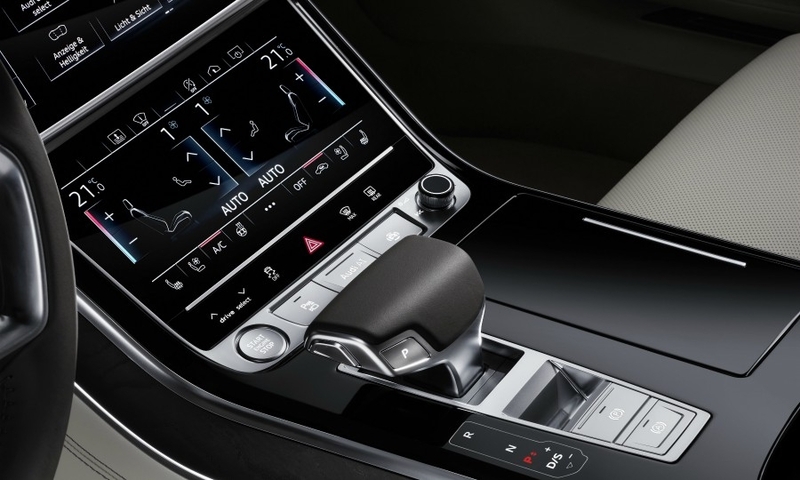 A second touchscreen below controls the heating and cooling functions. 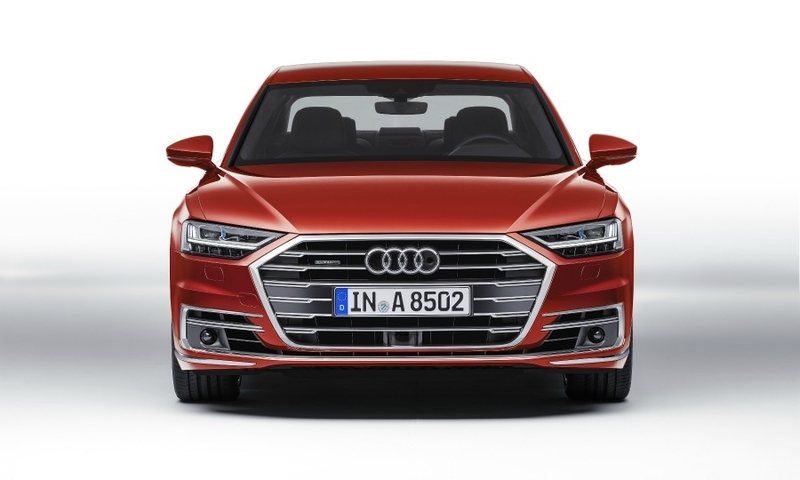 The A8 will be available in standard and long-wheelbase versions and will be built at Audi's plant in Neckarsulm, Germany. It will have its public debut at the Frankfurt auto show in September.